"Trolling for blue fish" lithograph by Currier & Ives, 1866. Outriggers are poles which allow a boat to troll several lines in the water without tangling. A boat which trolls enough lines can simulate a school of fish. Downrigger are devices used while trolling to keep a bait or lure at the desired depth. In practice, fish swim at different depths according to factors such as the temperature and amount of light in the water, and the speed and direction of water currents. A downrigger consists of a one or two metre horizontal pole which supports a weight, typically about three kilograms of lead, on a steel cable. A clip called a "line release" attaches the fishing line to the weight, and the bait or lure is attached to the release. The fishing line is reeled in by a spool powered either by manual cranking or by an electric motor. Using a downrigger can be hazardous. 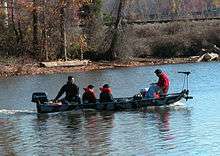 For example, man-made reservoirs can contain submerged trees and other structures beneath the surface which downriggers can snag. Paravanes (underwater kites) are sometimes used as depth controlling devices, particularly in commercial tuna fishing operations. These kites have various shapes, such as arrowhead paravanes, flexi-wing paravanes, and bi-wing paravanes. The devices can place the lure or bait at designated depths and positions; and in this way multiple devices can be towed at the same time without the devices and bait interfering with each other. "Spreaders" allow multiple baited hooks or lures to be trolled from a single line. There are many inventive spreader designs, such as devices which cause the baited hooks or lures to move in helical patterns, in a sophisticated emulation of the schooling behaviour of a group of fish. Planer boards are trolled devices designed to spread fishing lures out away from the fishing vessel. They allow multiple lines to be trolled. They come in dual board and inline board designs. Dual board designs consist of two boards that are spaced apart and attached by a line to a mast near the front of the boat with a separate fishing line in a spring tension release clip that separates when the fishing line is set. Inline boards are attached directly to the fishing line and a spring tension clip that releases upon setting or tripping the planer board so it slides down the fishing line to a swivel tied several feet in front of the lure. Inlines are popular with walleye fishermen. Once tripped they offer much less resistance when reeling in a fish. Planing Floats with Direction Control Paul Lieb US Patent 6,874,271 are planer boards that flip direction when given a tug. Shore Fishing Techniques using patented mini planer boards with direction control. Surface lures, also known as top water lures. They float and resemble prey that is on top of the water. They can make a popping sound from a concave-cut head, a burbling sound from "side fins" or scoops or a buzzing commotion from one or several propellers. Plugs are also known as crankbaits. These lures have a fishlike body shape and as they troll through the water they make various movements caused by instability due to a scoop under their heads. Swimbait, a minnow-like soft plastic bait that is reeled like a plug. Some have swimming tails. Spoon lures resemble the inside of a table spoon. They flash in the light while randomly wobbling or darting due to their shape. Spinnerbait, pieces of wire bent at about a 60 degree angle with a hook on the lower end and a flashy spinner mechanism on the upper end. Trolling baits and lures are either tied with a knot, such as the improved clinch knot, or connected with a tiny safety pin-like device called a "snap" onto the fishing line which is in turn connected to the reel. The reel is attached to a rod. The motion is of the lure is made by winding line back on to the reel, by sweeping the fishing rod, jigging movements with the fishing rod, or by trolling behind a moving boat. Lures can be contrasted with artificial flies, commonly called flies by fly fishers, which either float on the water surface, slowly sink or float underwater, in imitation some form of insect fish food. However some flies, such as the trolling tandem streamer fly, are designed for trolling behind a moving boat. As an example, marlin lures are typically 7-14 inches or more long with a shaped plastic or metal head and a plastic skirt. The design of the lure head, particularly its face, gives the lure its individual action when trolled through the water. Lure actions range from an active side-to-side swimming pattern to pushing water aggressively on the surface to, most commonly, tracking along in a straight line with a regular surface pop and bubble trail. Besides the shape, weight and size of the lure head, the length and thickness of skirting, the number and size of hooks and the length and size of the leader used in lure rigging all influence the action of the lure: how actively it will run and how it will respond to different sea conditions. Experienced anglers fine tune their lures to get the action they want. Specialized lures made specifically for trolling swordfish use plastic glow sticks. A pattern of four or more lures can be trolled at varying distances behind the boat. Lures may be fished either straight from the rod tip ("flat lines"), or from outriggers. In addition to attaching a lure to the fishing line, an oval piece of metal (often hammered or curved for reflective purposes) called a dodger is often used to attract fish from greater distances. Lures designed for trolling with downriggers include metal "spoons" that are often decorated with colour tape, and plastic or rubber "squids" with various colours. A daisy chain is a chain of plastic lures which have no hooks. Their purpose is to function as teasers which attract a school of fish closer to the lures that do have hooks. Baits and lures are typically trolled at speeds up to 9 knots, though speeds up to 15 knots can be used, particularly when boats are travelling to different fishing areas. The speed at which the lure is pulled through the water impacts on the fishing success. The optimum trolling speed varies with different species of fish, with weather conditions and the time of year, and other conditions. Chinook salmon can be successfully trolled at higher speeds than more docile lake trout. For these reasons fishermen use devices that accurately track speed. Trolling motors calibrate speed more accurately than large outboard motors. Trolling plates are also used with larger motors to slow the boat to the desired speed, although some anglers experience mixed results with plates. Trolling can be effective at surprisingly low speeds. Kayaks fitted with a deck-mounted bracket for holding a rod can be paddled to troll effectively for salmon. In marine environments trolling is used in big-game fishing to catch large offshore or open-water species such as tuna and marlin. Saltwater anglers also troll for inshore species such as bluefish, kingfish and various jacks. Rock fishermen can use an umbrella rig as a method of trolling without using a boat. Typically, an umbrella rig consists of four plastic neon green lures with a lead dragging behind. An additional lure is attached to the lead. Only the lure behind the lead need have hooks attached because this lure can appear to a stalking fish as a wounded or sick laggard in a school, making it a more likely target. A pattern of multiple baits or lures can be trolled at varying distances behind a boat. Lures can be fished straight from the rod tip (flat line), or from outriggers. Purpose designed sinkers exist to control the trolling depth on freshwater lakes. Freshwater anglers can also find trolling effective. Recreational fishermen can successfully troll lakes and reservoirs for salmon and trout. It can be the method of choice for catching the elusive muskie, and a useful technique for catching walleye, black bass and striped bass. For light and medium freshwater gamefishing, any reasonably robust casting or spinning rod can be used as a trolling rod. Effective trolling rods should be fairly stiff with a relatively fast action, since "whippy" slow action rods are frustrating to troll with. 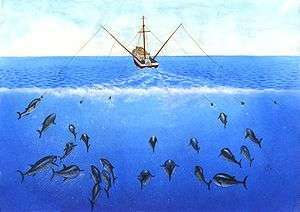 Commercial trolling for tuna is more successful near offshore banks than in open water areas, and is also enhanced in the vicinity of a fish aggregation device (FAD). 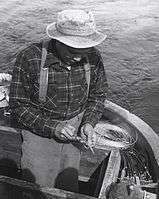 Historically, in Alaska, hand hook and line trolling were used to catch king and silver salmon in salt water. 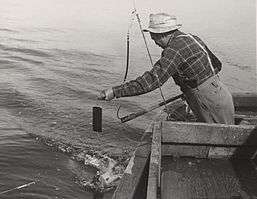 This method required minimal gear-boat, lines and hooks—and was used to catch fish that were still feeding in open water before returning to spawn. 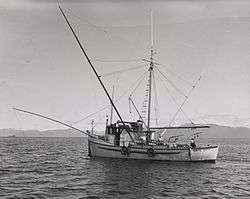 Trolling was very successful in southeast Alaska and historically the catch was used by the fresh and mild-cured fish packing industries. Power boats located near feeding grounds conducted most of the trolling. 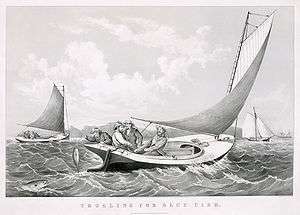 Each boat had four to ten lines, extending from tall poles hung outboard when fishing; each line carried several hooks, with heavy lead sinkers and spoons or baits as lures. Trolling lengthened the fishing season, allowing fishermen to fish in early spring before spawning runs. Internet troll, a modern use of the word "trolling"
↑ Slatter SO Outrigger assembly United States Patent 6668745, issued 2003. ↑ Francis ER Fishing lure for simulated feeding Patent number: 4858370, issued 22 August 1989. 1 2 Moritz AJL Trolling line sinkers Patent number: 2645053, Issued: July 1953. ↑ Schultz 2009, p. 219–220. ↑ Larson W Trolling depth controller Patent number 4486970, issued 11 December 1984. ↑ "Tuna Fishing an Underwater Bait Setting Device". fishing.sh. Retrieved 2015-08-31. ↑ "Patent US2914884 - Trolling device - Google Patents". google.com. Retrieved 2015-08-31. ↑ Barnett OL Rotating fishing lure spreader for use while trolling Patent number 4920687, Issued 1 May 1990. ↑ "Tips For Using Inline Planer Boards by Julia (Juls) Davis". walleyecentral.com. Retrieved 2015-08-31. ↑ "Walleye Fishing with a Planer Board - HowStuffWorks". adventure.howstuffworks.com. Retrieved 2015-08-31. ↑ "How to Use a Planer Board for Trolling | Planer Board". planerboard.com. Retrieved 2015-08-31. ↑ LeBoeuf KP Trolling lure and method of making same Patent number: 4215506, issued 5 August 1980. ↑ "Image: MCSquidDaisyChain.jpg, (191 × 223 px)". alltackle.com. Retrieved 2015-08-31. ↑ Matthews CL et al Trolling motor steering device Patent number 4386918, issued 7 June 1983. ↑ Schultz 2009, p. 218. ↑ Weber RW Fishing device Patent number 3844059, issued October 1974. ↑ Buckley RM, Itano DG and Buckley TW (1989) "Fish Aggregation Device (FAD) Enhancement of Offshore Fisheries in American Samoa" Bulletin of Marine Science, 44 (2): 942-949. 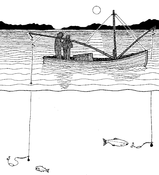 Merriam-Webster definition 2a: "to fish by trailing a lure or baited hook from a moving boat"
Hall P (1992) Trolling for Gamefish – Some Basic Techniques Fishnote No. 10. Northern Territory Government, Australia. Trolling Fact Card Seafood Watch. 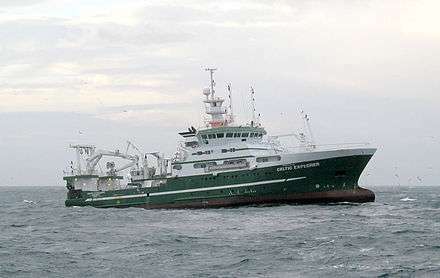 Retrieved 23 January 2012.